Battlestar Galactica’s “Twelve Colonies of Kobol” Star System Found? 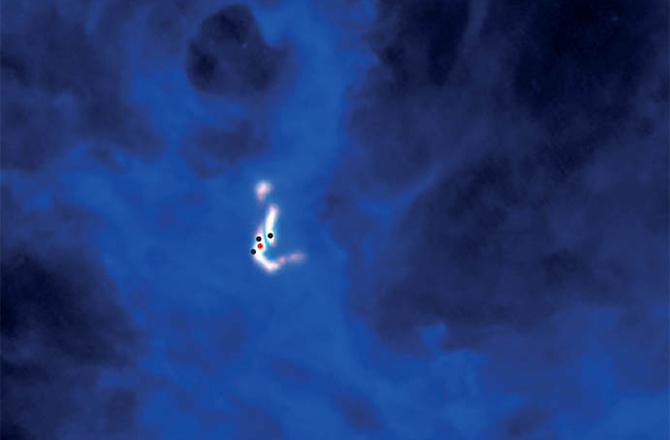 825 light-years away, in the constellation of Perseus, hides one protostar and three previously unseen gas concentrations that are undergoing gravitational collapse — basically embryos of soon-to-be baby stars. Found through the analysis of data from radio telescopes by astronomers at the Harvard-Smithsonian Center for Astrophysics (CfA), this tiny cluster of baby stars occupy a small volume only 10,000 AU across — meaning that they’d all easily fit within the confines of the boundaries of our solar system (yes, the Oort Cloud is the solar system’s outermost boundary). This is exciting for a couple of reasons. Firstly, this little ‘stellar womb’ has given astronomers an opportunity to study the genesis of a multi-star system. Indeed, most stars in our galaxy belong to multi-star systems, whether that be binary or greater, and astronomers are currently trying to figure out whether they were born this way or whether, over time, stars jostled around and eventually became gravitationally bound. After analysis of the velocities of the protostar and stellar embryos, it appears that the masses are gravitationally interacting. In other words, it has the potential to mature into a quadruple star system in around 40,000 years, a minute amount of time in cosmic timescales. Although it is likely that the system will become unstable, possibly ejecting one or two of the stars in the process, it does provide observational evidence that multi-star systems can be born in a gravitational embrace. But as I have a habit of linking astrophysical studies with science fiction imaginings, when I first saw this research, I immediately thought of the awesome re-imagined series’ Battlestar Galactica and Caprica. Battlestar Galactica is set in the years following the Cylon attack on the Twelve Colonies of Kobol, which almost wiped out humanity in this far-flung part of the galaxy. The remaining survivors, headed by William Adama (Edward James Olmos), take to the stars in a fleet of ragtag spaceships in search of the fabled Earth. One of my favorite scifi storylines and favorite scfi TV shows. But I digress. The Twelve Colonies consist of four stars — Helios Alpha, Helios Beta, Helios Delta and Helios Gamma — each with their own systems of planets, 12 in total, including capital world Caprica. So that poses a question: Just because Battlestar Galactica imagines a quadruple star system (well, two binary systems in a mutual orbit), is it possible to have such a stable system of planets evolve in a multi-star system? Or are the gravitational interactions too complex for anything to coalesce and slot into stable orbits? Well, by understanding how multi-star systems evolve by finding examples like this embedded inside star forming molecular clouds, we may start to appreciate how common and how stable they are and whether accompanying planetary systems are a reality or something that will forever be confined to the Twelve Colonies. Author Ian O'NeillPosted on February 23, 2015 Categories Sci-Fi/Sci-Fact, UncategorizedTags Battlestar Galactica, caprica, gravitational collapse, multi-star, quadruple star system, Science Fiction, Solar System, Stars, stellar physics, Twelve ColoniesLeave a comment on Battlestar Galactica’s “Twelve Colonies of Kobol” Star System Found?